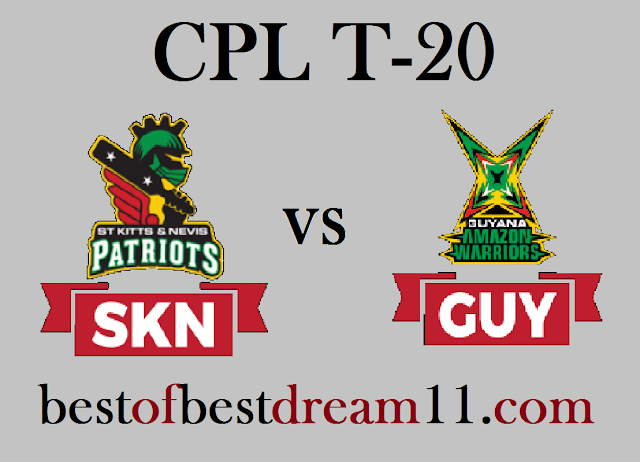 Here is best "St Kitts and Nevis Patriots vs Guyana Amazon Warriors" 19th match in Caribbean Premier league T20 2018, Dream11 Predictions for the Fantasy user ,who venue are looking to make a strong team for maximum win. We are providing latest news, match update, information about the match .The team is picked by using various factors on the basis of performance, ground stats and latest form. SKN Team eye on the third consecutive win when they faced Guyana on wednesday.They have played 5 matches,out of which 3 have won.This will be the second meeting for both the teams,when the two teams faced each other in the last match,then Guyana have won by 6 wickets. 1- Fot St Kitts, Chris Gayle and Evin Lewis have failed so far to give their team a good start. 2-Brandon King and Devon Thomas have done very well in their middle order for their team. 3-Ben Cuttings is making good contributionto his team both from ball and to the bat. 4- in bowling,S Cottrell and S Lamichhane will be crucialwith the ball. 5- For Guyana,Luke Ronchi and C Walton will be responsible for giving good start to their team. 6-Shimron Hetmyer is in good form and he has done very well in this series so far. 7-in bowling, Imran Tahir ,V Permaul and Sohail Tanvir will be crucial with bowl. * Shoaib Malik is out of the team,he has returned to his country.